A Weekend with Mr. Darcy is the first book of the Austen Addicts series first published in 201o but that I have only discovered last year. Sometimes I wonder how I have missed some books and this is clearly one of them. It is a modern Austen inspired romance that will bring together several Janeites at a Jane Austen Conference in the English countryside, and it describes my perfect holidays (if we consider time travel is not yet possible). Can you imagine a country manor full of Janeites attending the most diverse events dedicated to Jane Austen? Wouldn’t that be a dream? I absolutely loved the entire scenario this author created; the conference with all the events, the estate descriptions, the conversation the characters had, their discussions, etc. I felt I was in that manor with my fellow Janeites having the conversations we frequently have online, and part of me wished I could one day participate in an event such as the one Victoria Connelly created. At this conference we are introduced to two main female characters, Katherine Roberts, a professor at Oxford University with whom I connected immediately and Robyn Love a hopeless romantic trying to figure out who the perfect companion should be, her high school boyfriend Jace or Dan a dashing young man she meets at the conference. In a Weekend with Mr. Darcy we are transported into a Jane Austen conference where not only we will relate to many of the discussions taking place but also accompany the romances of these two main characters. I mentioned earlier that I related immediately with Katherine and she became a favourite of mine along with Warwick, her love interest. I liked their love story and their interactions even if I was a little a disappointed at him for taking so long to make the right thing. But I cannot say the same regarding Robyn. To be honest, this character bored me and I couldn’t like her. I didn’t dislike the character, I just could not like her. I think that one of the purposes of having two main characters in this story was precisely to be able to reach a broad audience and to capture the attention of everyone, and that worked out for me because even if I didn’t love Robyn I was always eager to read more about Katherine. While I didn’t love Robyn, I’m sure many readers will prefer her character to Katherine’s and will be more interested in her love story with Dan. This is particularly interesting, and it reminds me a little of the differences between Elizabeth and Jane. I prefer Katherine’s stronger character, but I’m sure other readers will related more to Robyn’s insecurities and dilemmas. 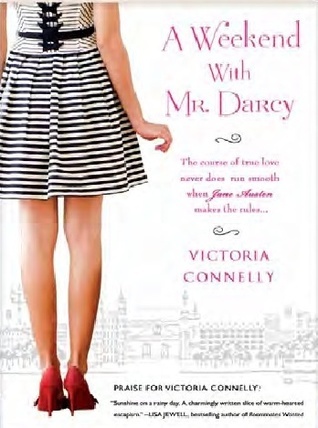 I really enjoyed this book and considered it a fun, light romance that will appeal to all Janeites. Wasn’t this a delightful weekend with Mr. Darcy? I thought it was adorable. I was lost in the activities of the Austen Conference weekend and felt like I was there in the discussion groups and the trivia was amazing. I knew a few things but was happy to learn something new. I’m so glad you found this delightful book Rita. Thanks for posting this informative review. This is a book I read long ago. I don’t remember it but I checked and I did post a review on Amazon. Glad you enjoyed it.